One year after graduating from college, in 2009, about 8 percent of female graduates who earned their degrees in 2007–08 were unemployed. Compare that to male college graduates during the same time period. Ten percent of them were unemployed. 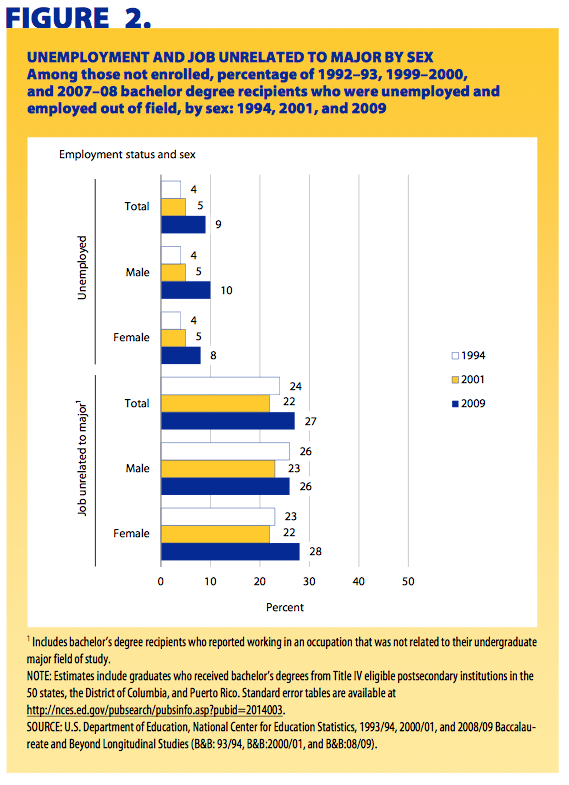 That’s according to the National Center for Education Statistic’s brief, New College Graduates at Work: Employment Among 1992–93, 1999–2000, and 2007–08 Bachelor’s Degree Recipients 1 Year After Graduation, released on March 6, 2014. Both are depressing unemployment rates, but keep in mind we were in the middle of a recession. I remember, when I was covering the 2008 recession at my old radio show Marketplace, that men were disproportionately hit in the layoffs. That was because men were more likely to be working in construction or factories, two sectors that were hit hard. But these were, for the most part, men without college degrees. At first glance, I find it puzzling that employers would prefer to hire a female college graduate over a male one. Perhaps women have a leg up when it comes to entry level positions these days? Any thoughts? One answer is deeper in the data. Twenty eight percent of women were working in a job unrelated to their major, whereas only 26 percent of men had made that decision to get a job outside of their field. Female graduates seem more willing to compromise and take a less-than-ideal job that comes their way.